Josephine is a member of the Wisdom and Intuition Network, an international community of intuitives. The network provides free weekly calls giving world class psychic information on spiritual growth, intuition, and guidance. 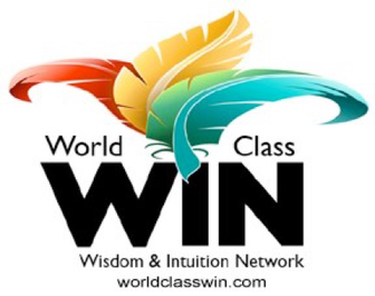 WIN, is a group of intuitives that have come together to offer free teachings to help us all in our human evolution. We are a “Family of Intuitives” networked together through our shared intention to support those seeking to trust their inner Wisdom and apply it with Intuitive clarity. Intuition is that guiding presence that reveals inner wisdom and truth about our lives. Everyone has the capacity to be intuitive, even on those days when we fail to see it. Sometimes, we just need a safe place to nurture it. Using principles that promote expansion of consciousness and expanded awareness, our WIN intuitives are committed to knowing that we are totally connected in wholeness. As we awaken to being whole, we realize that our love and our compassion is who we are and we open ourselves to new vistas of consciousness and a world filled with joy and peace. WIN also has a range of inspirational guest speakers interviews ~ giving a wonderful window into how to use spiritual awareness and intuition in your everyday lives. WIN offers free teleseminars throughout the month, sign up for our newsletter below to get the links, dates and latest information. To learn more you can visit the WIN website. or like us on Facebook and follow us on Twitter.